Pockets hold horizontal or vertical prints up to 4x6, plus aps panoramics. Shaded background enhances photos. Memo area next to each pocket. 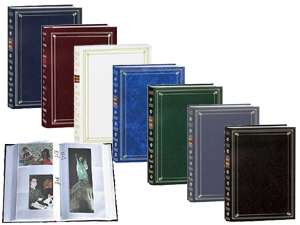 This post bound album features a durable leather-like cover and can hold a large number of 4x6 photos or panoramics. Overall album dimensions: 9-5/8" x 13-7/8"